Spoiler alert: It really wasn't hard to find three stocks with superior appeal to income investors. This large dividend yield is full of hot air. Frontier Communications (NASDAQ:FTR) sports a massive 7.4% dividend yield. This is the third-highest yield among members of the S&P 500 index. That's pretty much the perfect dividend stock, right? Where do I sign up? Not so fast. A hefty yield is not always a good sign. In fact, it's actually a red flag sometimes. As it turns out, Frontier is one of those cases. Let me explain why you probably should put down that buy order for Frontier shares, and back away slowly. Your portfolio would be much better served by a mundane electric utility company such as Consolidated Edison (NYSE:ED), or a boring retailer like Target (NYSE:TGT). If you insist on sticking within Frontier's core business, you could take a closer look at giant cable service provider Comcast (NASDAQ:CMCSA). No, none of these tickers comes close to matching Frontier's meaty yield. 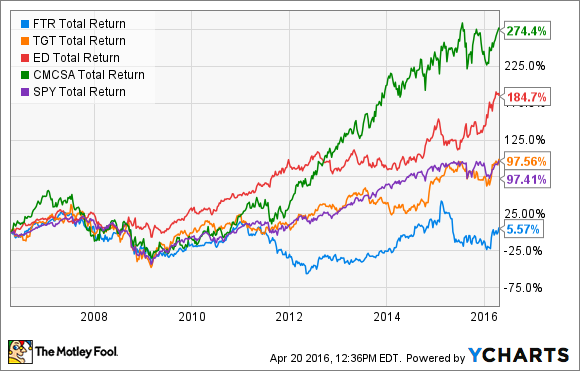 Frontier has provided the richest yield among these four stocks at all times during the last 10 years. Today, Edison's dividend yield stands at 3.5%, well ahead of Target's 2.6% and Comcast's underwhelming 1.7%. FTR Dividend data by YCharts. Edison's history of uninterrupted dividend increases goes back 41 years, starting in 1975. Target's streak is even longer, stretching back 48 years to 1968. Comcast was relatively late to the dividend game, getting started in 1992, and often merely holding its payouts steady in the early years. 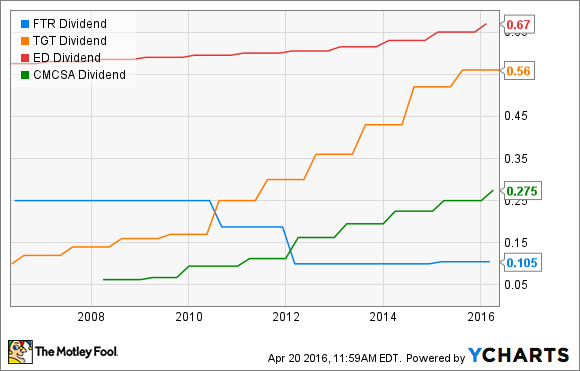 The cable giant's current streak of dividend increases only has five years of history. By contrast, Frontier has only increased its payouts once in the last five years. That was a paltry 5% increase in the first quarter of 2015. Before that, the regional telecom committed the cardinal sin of reducing its dividend in 2012. Dividend checks per share were slashed by a massive 47%. Including another cut in 2010, Frontier shareholders saw their dividends reduced by 60% in less than two years. And that was on the heels of Frontier's management vowing that they were "very committed to maintain your $0.75 annual dividend." The company pumped out an avalanche of new shares to support stock-powered buyouts of landline assets no longer wanted by larger telecoms. It makes sense to scale back dividends in the face of huge dilution, because otherwise, that dividend policy could get expensive in a hurry. Frontier's share count tripled overnight in 2010, after all. But none of these moves were shareholder friendly. The value of existing holdings plummeted drastically, along with a matching reduction of dividend payouts. That is not how you build a reputation as a stable and profitable dividend provider. Even Comcast gets to point fingers and laugh at Frontier's conduct here. In short, Frontier's dividend looks juicy on the surface, but has very little substance when you dig deeper. Target, Comcast, or Consolidated Edison would be far superior picks for your income-focused portfolio.